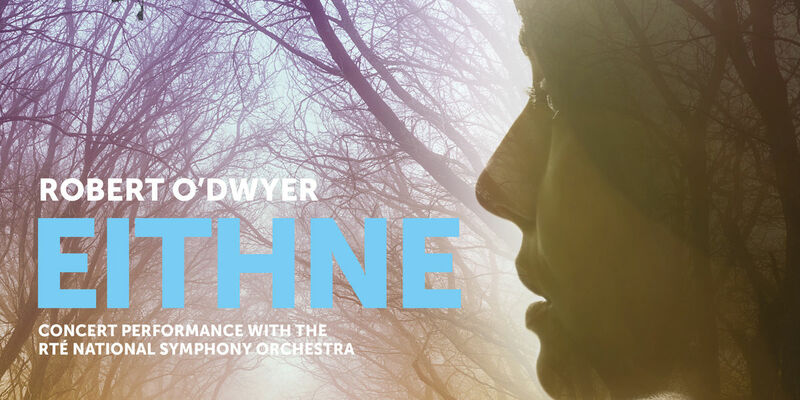 Dublin’s Opera Theatre Company recently revived the first Irish-language opera, Robert O’Dwyer’s (1862 – 1949) Eithne, for its first performance in over a century. Although Eithne was well-received by contemporary critics for its contribution to the Gaelic revival movement and as an attempt to establish a national opera tradition, the opera has been mysteriously forgotten for over a century. In celebration of the long-overdue revival, ITMA has digitised and made available online its copy of the 1910 publication, and delved into its resources to uncover the historical background of the piece. Additional research materials, including the original manuscripts, contemporary news articles, and miscellaneous ephemera were found in the National Library of Ireland's collection. O’Dwyer’s adaptation of the legend provides a much more elaborate version of events. The hero, Ceart, is the eldest son of the High King of Ireland who narrowly escapes banishment after a false accusation that he killed the King’s favourite hound. Ceart’s redemption arc to not only further prove his innocence but also his suitability as heir to the throne takes place in the second act. While on a hunt, the High King is captivated by a mysterious singing bird and the apparition of a sorrowful but beautiful maiden, which vanish into a nearby cave. 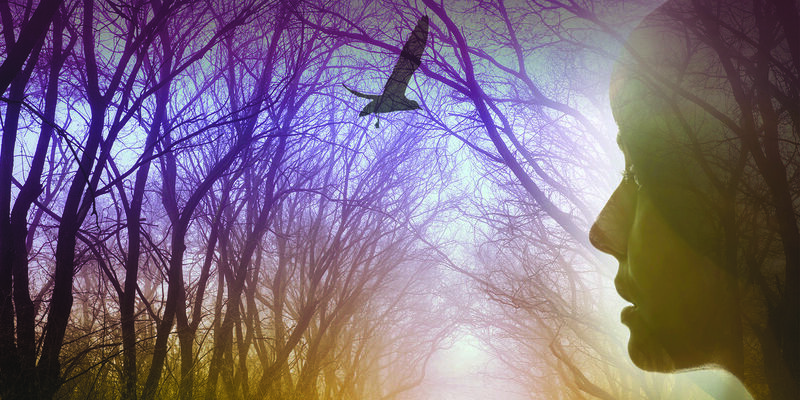 Ceart bravely volunteers to enter the cave and discover the secret of the bird and the maiden. In the cave, Ceart must defeat a giant guardian spirit to enter Tir-na-n-Og (The Land of Youth, a supernatural realm in Irish mythology), where he must defeat the king of Tir-na-n-Og to undo the curse placed upon the bird and Eithne. Lyrics and a full synopsis of the plot can be found in the Opera Theatre Company’s programme of the revival performance. 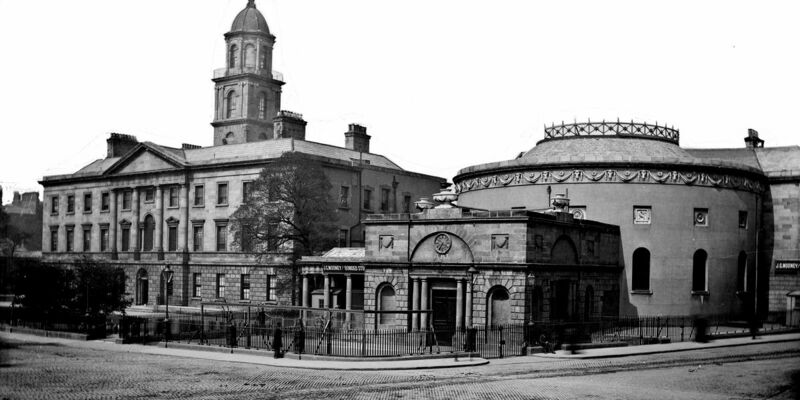 Although proponents of the turn of the century Gaelic Revival lamented at the absence of a national opera tradition in Ireland, foreign operas enjoyed minor but steady popularity in Ireland from as early as 1705. Some English operas such as John Gay’s The Beggar’s Opera (1728) incorporated Irish airs and traditional songs, and popularised a tradition of comedic ballad opera (or light opera) in Dublin. Despite the arrival of other foreign opera traditions, English and Irish ballad operas proved to be the enduring form of opera in Ireland. In the classical era (1775 – 1830), Irish composers, writers, and artists tended to leave Ireland for more steady work in London. However, Irish stages did see an increase in English-language works more complimentary to Ireland, drawing from mythological themes throughout the nineteenth century although by this time Romantic Italian operas were preferred. As the style of music in vogue, Europeans looked to foreign operas to familiarise themselves with the national life of foreign nations. Yet despite a small, but healthy, appetite for opera in Ireland, a large resource of fascinating folklore and song, and prolific writers, Ireland had failed to establish an operatic tradition that would fill the Irish with pride and delight foreign audiences. Despite a small, but healthy, appetite for opera in Ireland, a large resource of fascinating folklore and song, and prolific writers, Ireland had failed to establish an operatic tradition that would fill the Irish with pride and delight foreign audiences. Given the lack of a genuine Irish opera tradition, It is understandable that proponents of the fin de siécle Gaelic Revival called for the establishment of Irish-language operatic works. The Gaelic Revival movement inspired by Irish nationalism largely focused on the revival of the Irish language, history, and folklore. Although literature was naturally the most popular medium for a language-based movement, the role of traditional music in Irish life and as a vehicle for folklore naturally brought music into the movement's discourse. The desire for the revival to honour the past while simultaneously propelling Ireland into the future meant that incorporating contemporary artistic tastes such as opera had a welcome place in the revival. Robert O’Dwyer was born and raised in Bristol, England to Irish parents where he was classically trained in music, beginning his career as a chorister and assistant organist at various churches. At age 27 in 1889, O’Dwyer began conducting amatuer orchestra and worked with various touring opera companies until he settled in Dublin in 1897 to work as an organist and teach music at the Royal University of Ireland. At the time of the 1911 census, O’Dwyer lived with his family at 97 Rathmines Road and later at 9 Upper Leeson Street. 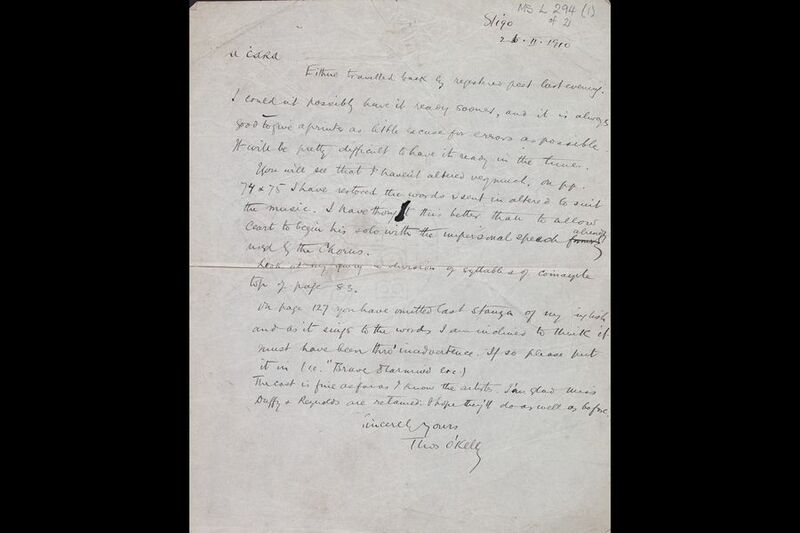 Letter from Thomas O'Kelly to Robert O'Dwyer, discussing changes for the opera's second performance in May 1910 at the Gaiety Theatre. This would be the final performance for a over century. Eithne travelled back by registered post last evening. I couldn't possibly have it ready sooner, and it is always good to give a printer as little excuse for errors as possible. It will be pretty difficult to have it ready in the time. You will see that I haven't altered very much. On pp. 74 & 75 I have restored the words I sent in altered to suit the music. I have thought this better than to allow Ceart to begin his solo with the impersonal speech already used by the chorus. Look at my query on division of syllables of Coinagileon top of page 83. The cast is fine as far as I know the artists. I'm glad Miss Duffy + Reynolds are retained. I hope they'll do as well as before. Eithne was revived by the Opera Theatre Company on 14 October 2017 at the National Concert Hall in Dublin with the RTÉ National Symphony Orchestra. A significant addition to the cast was Dr. Gavin Ring, baritone, as the High King of Ireland. Dr. Ring is a prominent scholar on the opera whose doctoral thesis examined the political and cultural reasons for Eithne's neglect and argued for the necessary performance considerations for a revival adaptation. A full list of the cast as well as additional background information on the piece can be found in the Opera Theatre Company's programme linked above. The performance was recorded by RTÉ Lyric Fm and can be viewed below or on youtube. Ceoldrama is the rough Irish translation used for opera, a combination of the words for music and drama. 5. Ring, Gavin, Performance Considerations for Robert O'Dwyer's Eithne (1909): A Contextual Study and Edited Vocal Score (Doctoral thesis, Dublin City University, 2016), 38.